Last year a powerful thought literally stopped me in my tracks. I had never had this kind of thought before. See, I had always lived in pursuit of things and plans which I had believed I had to chase aggressively. Often I got caught up in thoughts and feelings which at times led to anxiety and frustration. The paradigm-shifting thought came to me while I walked along the Credit River beside my home. It was a brilliant spring morning and the sounds of the birds reminded me that nature was about to awaken for a fresh new season. The sky was blue and the trees were beginning to come to life again; I enjoy walking in nature to settle and relax my mind into Mother Nature allowing her to mother me. These walks are my own definition of prescribed therapy. As I gazed at the fast flowing wide river, it represented a metaphor of my life’s journey, my need to enter the sometimes wild waters with the desire or need to cross it. Braving to cross it represented the pursuit of my life goals. I envisioned myself wading into the water and looking for a spot on the far side. I saw myself fighting and struggling against the current to conquer the speed and violence of the rushing water in order to reach my target on the other side of the river. Then the liberating thought took over my mind; what if I entered the waters and floated on my back? I could then picture myself being taken down the river with little effort. I saw myself making my way down stream over the rushing water and riding its natural current, ebb and flow. Literally ‘going with the flow’. I pictured how I could now, with a new patience and faith, be able to ride a circling eddy that would gently deliver me on the other side of the river where I could step onto shore. 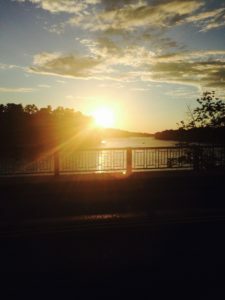 As this concept took hold and grew in my mind I contemplated the possibility that this was how my life could now occur; Focusing on an intention and moving in that direction and allowing the natural ebb and flow of life to take me where I wanted to go. You can have anything you want in life as long as it is rooted in intention and you follow your inner voice in a relaxed and confident manner. Surrender into your journey for it has so much more to offer than your destination. Oh yes, also let go of how it should occur. Never focus on the fact that your plan or dream has not happened yet; as the road is still under construction. “The river is still moving you along”. Follow your passions with an open heart and allow the world happen to you. I would love to hear about your own stories and experiences. I’m offering a free e-book of Love, Care and Share to anyone contacting me through my website: www.lovecareandsharebook.com Share your comments or stories or just ask for the free gift in your preferred format. All I ask is that after you’ve read it that you offer the e-book to another. This is a “Read it Forward” initiative. My intention is that you help spread the messages in this book to someone who comes to your mind as you read.